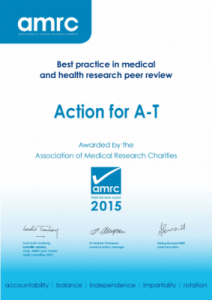 We are delighted to announce that Action for A-T has been awarded an AMRC (Association of Medical Research Charities) ‘BEST PRACTICE IN MEDICAL AND HEALTH RESEARCH CERTIFICATE’. Peer review is an accepted means of assessing the quality of research, and AMRC believes that it is the best way for medical research charities to decide what research to fund. Medical research charities use peer review to award grants so that their decision making is independent and transparent. The validity of peer review is based on certain principles: for example, that there are no conflicts of interest, the expert scientific review is high quality, independent and unbiased. The audit confirms that Action for A-T use robust methods to make decisions about which research projects to fund and that we support the best researchers and the highest quality research, with the best chance of improving the lives of those affected by A-T. We believe that funding high quality research is the very least that children and adults living with A-T deserve. Our latest grant round is now open until the 28th March and we look forward to bringing you more exciting news about our latest research in the coming weeks.